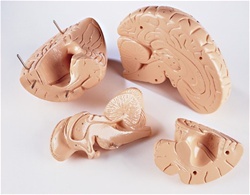 Our Giant Brain Anatomy Model is a student edition model wherein, it incorporates simplified numbering and a budget-stretching monochrome painting scheme. It has an overall dimension of 20x20x23 cm, perfect for presentation to a larger group. This student edition model is made of a non-breakable vinyl and each part of its components are locked together with pins and will remain intact even if you pass it around. Unless you pull it apart. It has a number coding system in which all of the fifty principal features of the cerebral lobes, cerebellum, brain stem, and ventricles are all number coded for easy identification. It is accompanied with a key card which is great for an introductory study. This giant brain model is 100% American made because every step of its production was all carried out in the US! That includes, model molding, hand sanding, hand painting, and numbering. DURABLE- This student edition of a giant brain model is made of a non-breakable vinyl and each part of its components are locked together with pins and will remain intact even if you pass it around. FUNCTIONAL- It has a number coding system in which all of the fifty principal features of the cerebral lobes, cerebellum, brain stem and ventricles are all number coded for easy identification. It is accompanied with a page key which is great for an introductory study. LIFETIME GUARANTEE- These Autographed Anatomy models carries a lifetime guarantee that we will replace or repair your model FREE of charge once it has been proved that it has a factory defect; As long as you owned the model. GIANT-SIZE- This has an overall dimension of 20x20x23 cm which is twice the size of a life-size model of a human brain; perfect aide to both medical professionals and students for a hands-on study and presentation to a larger group.